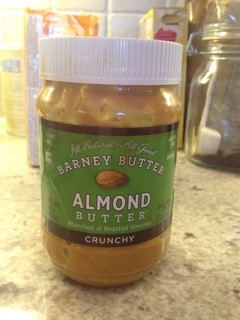 I have been buying “Barney Butter” Almond Butter as my brand of choice. I first tried it because it was the cheapest almond butter in the organic section at Fairway, and was often on sale. I thought it’s sweet, creamy taste superiority was because, as it says on the top, it’s made with “a blend” of marcona almonds. You can also get this treacherous product at Whole Foods. And then just recently I thought, wait a minute, why is this one so much sweeter than my other almond butter, and looked at the ingredients. Yes, it has “evaporated cane juice”–i.e. SUGAR as its second ingredient. It also isn’t organic. Boo. I’ve been seeking a new treacherous product. Here is my recipe for it: Open lid, insert spoon into jar, insert spoon with contents into mouth. Repeat with clean spoon to taste.